As fire lines were established Sunday around 92 percent of the fire that swept through eastern Alpine, the confirmed number of structures lost in the blaze jumped to 57. The 505-acre fire destroyed 34 residential buildings, 22 outbuildings and a commercial building as of Sunday afternoon, Cal Fire San Diego announced. It also damaged another 15 residential buildings and five outbuildings. Evacuation orders were lifted in their entirety Sunday, as firefighters and government workers were able to survey the damage safely. The blaze began about 11:15 a.m. Friday on the south side of Interstate 8, at West Willows Road, east of Alpine, according to Cleveland National Forest officials. 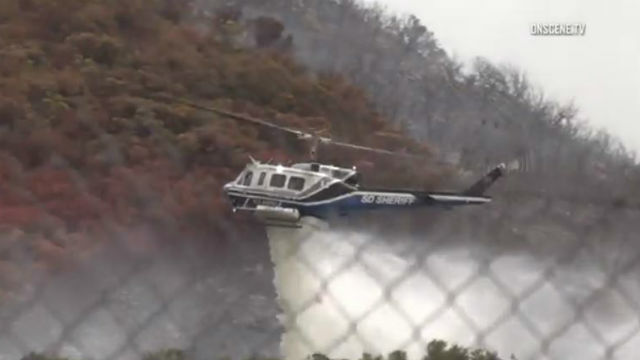 The wind-stoked flames soon reached a “critical” rate of spread, Cal Fire reported. On Friday, television helicopters showed large tile-roofed homes residential trailers and small outbuildings engulfed in fire. One crew member suffered minor burn injuries to his face while battling the blaze, and had been expected to remain hospitalized overnight, Cal Fire reported. At the height of the blaze, about 3,500 homes and businesses at and around the site of the wildfire were without power, according to San Diego Gas & Electric. Some of those addresses are served by a circuit that the utility decided to deactivate as a precaution, and the rest lost service due to fire- related equipment damage, SDG&E spokesman Wes Jones said Friday. Power had been restored by Sunday afternoon to 510 customers out of 640 who lost power, according to SDG&E. Evacuation orders had affected communities including Suncrest Vista Lane, Highlands View Road, Manzanita View, Olive View, Scenic View Road, Pine View, Viejas View Place, Sage View, Oak View Road, Verde View Road, Calle Caleta Viejas and Via La Mancha. Gov. Jerry Brown declared a state of emergency for the area late Friday. Posted in Crime | Tagged Acres Burned, Alpine Fire, contained, containment, evacuations, state of emergency, West Fire, what started the fire?